As one of three original counties founded by William Penn, Chester County enjoys a rich and vitally important role in the development of this country. The interpretation and preservation of historic structures, landscapes and other resources at the County level is a collaborative partnership of the Chester County Planning Commission, the County Archives & Records Services Department and Chester County Facilities & Parks. We are here to answer questions about the history of Chester County and to provide technical assistance to the County's 73 municipalities, for profit and non-profit organizations representing historic resources, and history minded residents who are ultimately responsible for the wealth of historic resources that we all enjoy. 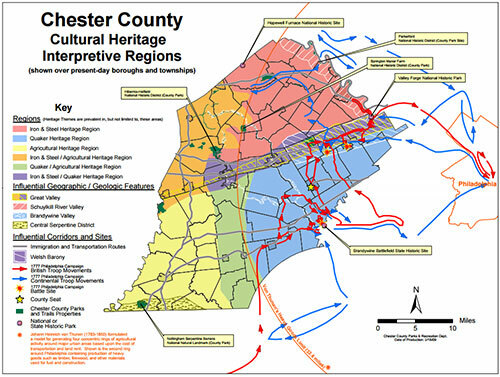 The mission of the Chester County Planning Commission is to provide future growth and preservation plans to citizens, so that they can enjoy a Chester County that is historic, green, mobile and prosperous.Â The Landscapes2 goal regarding historic resources is to protect and maintain Chester County’s fabric of historic and archeological resources and cultural landscapes for the benefit of current and future generations while promoting sustainable development.Â These policies are advanced through planning activities (specifically the Vision Partnership Program), the Act 247 process, the activities of the county’s heritage preservation coordinator (acting as the county’s Historic Preservation Officer), and other activities and partnerships. The Chester County Historic Preservation Officer was created by the Chester County Board of Commissioners and approved by the federal government in 1981 to provide necessary coordination between the county, the Pennsylvania Historical and Museum Commission, state and federal agencies and the general public when identifying and addressing the county's individual historic resources and their history based upon the National Preservation Act of 1966 as amended. The Chester County Archives was established in 1982 to preserve and make available the historic records of Chester County. The archives currently holds over 2,655 volumes and 1,779 cubic feet of original public records of enduring historic and cultural value. Serving over 3,200 researchers a year, the archives is a primary destination for genealogists, property researchers, local historians and academics researching all facets of Chester County history. In 1985 the archives expanded to include micrographics and records management sections. To help facilitate the disposal, access, preservation and management of current public records, records management ensures that county departments follow the guidelines established by the State of Pennsylvania and the Pennsylvania Courts. The Chester County Archives is administered by the Chester County Historical Society in cooperation with the County of Chester. Springton Manor Farm's legacy of agricultural & land stewardship. Interpretation of historic resources adjacent to or part Chester Valley Trail, the Schuylkill River Trail and the Struble Trail such as the Parkerford Historic District, Fricks Lock Village and the Phoenixville Canal.